Leprosy is catagorized by the number and type of skin affected on the body. If five or fewer areas on the body are leprous, it is called paucibacillary. There isn't supposed to be any bacteria on those samples of skin. If six or more leprous areas are on the body, it is called multibacillary. In this case, the person may or may not have bacteria found on the skin samples from the infected area. There are other ways that leprosy can be classified. Leprosy can be considered tuberculoid, lepromatous, or borderline depending on the symptoms described by the infected person. 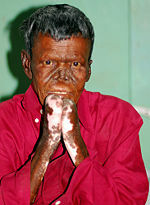 People with tuberculoid leprosy are those with fewer leprous areas than those with lepromatous or borderline leprosy. Tuberculoid leprosy is generally less severe, less common, and less contagious than the other classifications of the disease. The type of leprosy one has determines how long antibiotic treatment should last, as well as how many long-term complications there will be. Leprosy causes nerve damage which results in a loss of sensation in the extremities. This man's feet are too weak and deteriorated for him to walk. Because the bacteria that causes leprosy multiply very slowly, it usually takes about four years for symptoms to show for tuberculoid leprosy. Lepromatous leprosy and borderline leprosy symptoms occur usually about eight years after first coming in contact with the bacteria. After the symptoms begin, it takes a long time for the disease to progress. Leprosy damages mainly the skin and peripheral nerves. Leprous nerves makes the skin lose sensation and the muscles feel weak due to the infected nerves in the area. Skin infection can lead to areas of swelling and bumps, which can disfigure the face. A few common areas affected by leprosy are the feet, nose, hands, eyes, testes, and kidneys. In tuberculoid leprosy, a few flat, whitish, numb rashes appear in a few areas of the body. In lepromatuous leprosy, small bumps and larger raised rashes are found on more parts of the body. The bacteria damage to the nerves causes extreme numbness to the the infected areas. Borderline leprosy has symptoms of both tuberculoid leprosy and lepromatous leprosy. At this stage, symptoms can either worsen or get better depending on whether treatment is given. 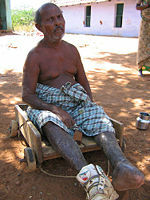 This man has had leprosy for 17 years. The collapsed nose bridge is a typical sign for leprosy. Risk of spreading leprosy is low because only the untreated lepromatous form is contagious, and once treatment has started, leprosy cannot be spread. The best way to prevent the spread of leprosy is the early diagnosis and treatment of people who are infected. For household contacts, it is recommended to have every family member have annual examinations for at least five years after last contact with a person who was infectious. Avoiding contact with bodily fluids from the infected person is a good prevention, as well as avoiding contact with any rashes on the infected person. Most people's immune systems can fight off the bacteria before it becomes a problem, so even if you come in contact with a leprous person, you aren't guaranteed to contract the disease, but it is still wise to stay clear until treatment has begun. People who develop leprosy may have genes that make them susceptible to the infection once they are exposed, most are not susceptible to contracting the disease. A vaccine called Bacille Calmette-Guérin, used to prevent tuberculosis, provides some protection against leprosy, but it is not often used to prevent leprosy. For the longest time, there was no cure for leprosy, and lepers were forced to be segregated from society for extended periods of time. 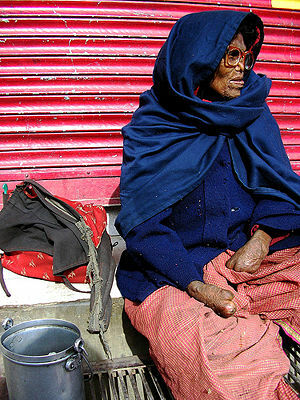 Nowadays, most people with leprosy are treated and easily cured with antibiotics. In addition, when diagnosed early and treatment is started, many symptoms and complications can be completely avoided. The length of time a person is treated will vary depending upon the form of the disease that a person has. The types of antibiotics to kill the bacteria that causes leprosy, Mycobacterium leprae, varies depending on which form of leprosy it is. Several antibiotics are often combined together because the bacteria is sometimes resistant to antibiotics. The most commonly used antibiotics are Dapsone, Rifampin, Clofazimine, Clarithromycin, Ofloxacin, Levofloxacin, and Minocycline. Depending on the severity of the infection, treatment continues from 6 months to many years. Some doctors recommend lifelong treatment with dapsone for people with the lepromatous form of leprosy. Antibiotics are highly effective in curing leprosy, but it cannot reverse any nerve damage that has already occurred prior to starting treatment.